When my younger sister, brother and I were growing up we had these scrapbook/photo albums. They were called School Day Treasures and there was a page for each grade in school. 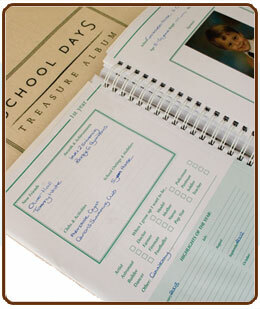 There were spaces to write in your teachers' names, activities you were involved in, a place for photos and each page was a folder where you could keep mementos like report cards and other school work. My sister probably still has hers. Our books had a different cover than what is shown here but the inside pages were the same. Posted by Karen at 1:22 p.m.